"The Dead," is the closing story of Joyce's Dubliners collection that takes place in Dublin, Ireland in the early 20th century. It is winter, and the characters are attending a holiday party at the home of the main characters' aunts'. 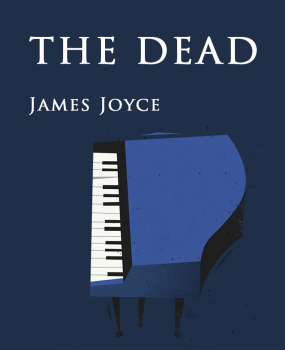 In "The Dead" Joyce joins the themes of isolation, mortality, failure, politics, religion and paralysis. Beyond these elements, the story illustrates important aspects of Modernist literary technique. The Dead LILY, the caretaker's daughter, was literally run off her feet. Hardly had she brought one gentleman into the little pantry behind the office on the ground floor and helped him off with his overcoat than the wheezy hall-door bell clanged again and she had to scamper along the bare hallway to let in another guest. It was well for her she had not to attend to the ladies also. But Miss Kate and Miss Julia had thought of that and had converted the bathroom upstairs into a ladies' dressing-room. Miss Kate and Miss Julia were there, gossiping and laughing and fussing, walking after each other to the head of the stairs, peering down over the banisters and calling down to Lily to ask her who had come.